The ScatterLineSeries are represented on the chart as data points connected with straight line segments as shown on the image below. ScatterLineSeries class inherits from the ScatterPointSeries class - See the inherited properties. Stroke (Brush): Gets or setst the Brush instance that defines the stroke of the line used to present the series. StrokeThickness (double): Gets or sets the thickness of the line used to present the series. 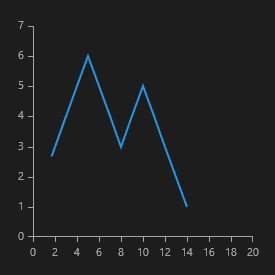 Here's an example of how to implement a RadCartesianChart with ScatterLineSeries.